These days, they have a national day for just about everything and National Eggs Benedict Day is no exception. 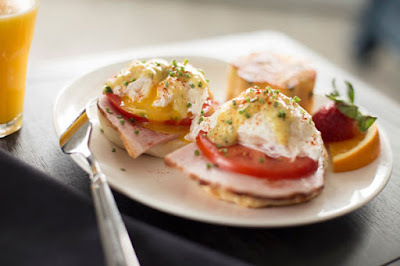 National Eggs Benedict Day on April 16th and you if you're looking for an easy-to-prepare recipe...we've got one for you! Today's guest post recipe is courtesy of Huron House Bed and Breakfast. The Oscoda, Michigan, B&B is well-known for its delicious breakfasts and tends to make this Eggs Benedict recipe at least once each week. The recipe makes one serving. Huron House typically serves this with “stuffed” hash browns. Add diced green onions, sour cream and shredded cheddar cheese to shredded hash browns – grill until brown on each side. About Huron House: Located on the beach of Lake Huron between Tawas and Oscoda, the Huron House is an award-winning 14 room luxury Bed and Breakfast lakefront destination with stunning Lake Huron views and direct beach access. Huron House features King beds, private decks, fireplaces, personal hot tubs and Jacuzzi tubs, and daily breakfast delivered to guestrooms. Privacy and individual attention define the Huron House experience. The Huron House Bed and Breakfast is located at 3124 North US-23, Oscoda, Michigan 48750. To make a reservation call (989) 739-9255 or click the link above (at the top of this post). I like this version of Eggs Benedict with the added herbs of tarragon and dill. I also never used cream cheese in this recipe and I love that idea.